“In computing, reactive programming is a declarative programming paradigm concerned with data streams and the propagation of change. ramifications before you go to the technical stack or ecosystem. And that had bring me in to two projects where mobile and cross platform was a topic and that the interface was must reactive. choose so many times Angular or View over Angular, but that would be another post. The buttom line is that i have launch 2 mobile projects powered by React Native one with a team and another as one man show and have deliver also some SPA’s in React.js. God knows how much i think React is powerfull and how many times i say that not always having a good use especially in teams. React is one off that technologies to easy and quick to enter, and many times difficult to make a right use. That´s why after many requests i will launch soon a workshop where i will teach everything i had learn and the best pratices i have. So keep tone and i hope soon to bring you all my trenches lessons of react. 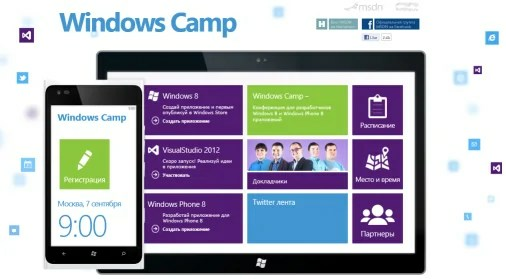 Last February i was nominated by Microsoft DPE circle as DPE Trainer to Windows 8.1 DevCamps. I am really proud of this recognition by the Microsoft DPE Europe, will be a big resposability to teach and help developer’s and architects all over the place to be better developer’s or how to develop to this amazing platform that is Windows 8.1. There is also the coniue of a training work i had been doing since the launch of Windows Phone and the pre release of Windows 8. I am proud and acaiable for this envangelic chalenge to help each day the development community to understand and make a better usage of windows 8.1. This week i had give for the second time this year a train session for quick ignition in to the windows 8 development. For the ones who follow me where you have the slides i use in this sessions feel free to use share and if you have any question feel free to ask. I was invited as a speaker to talk about Offline Webapplication at the private talks of Open software development teams. 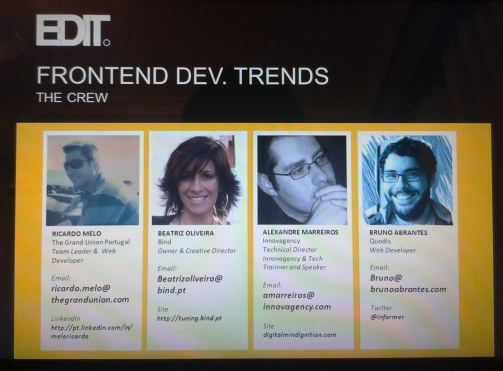 Is funny to get back to their stage to talk about Web technologies…In the past they were one of my first class client’s when i was a freelancer core developer. Thanks for the invite, will be a pleasure to get back, this time to speak about technology in a house where technology and sotware was always viewed as something free and important to make things go futher. 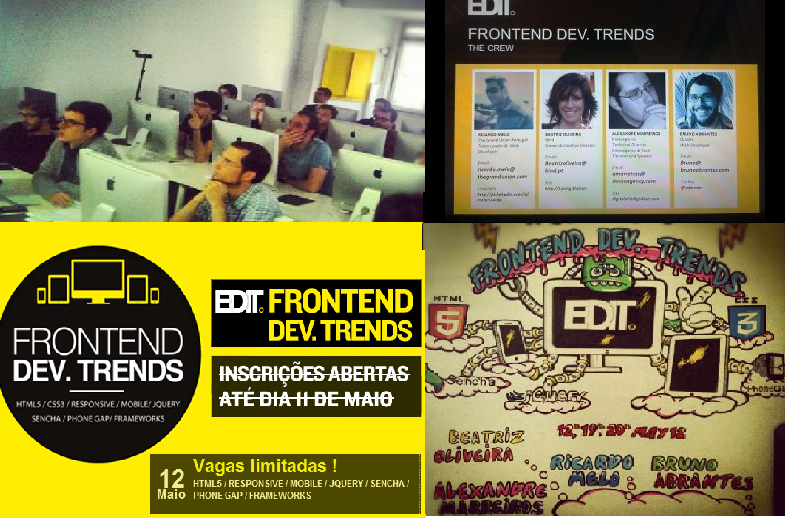 As i had said last week the workshop of EDIT about Front end dev trends, mobile and HTML 5 that i had been working with Ricardo Melo of Gand Union Portugal, Bruno Abrantes of Quodis and Beatriz Oliveira of Bind, have already start. Today was the lst day of the workshop. Is fantastic to see that every student had anchieve their goal. Responsive was one of the big names of this workshop and one of the greatest quest of this students. Looks like this part had gone well too and our 27 students are ready for the responsive concept Challeng. Was hard work to put everything working for this workshop a great effort, and a huge success for us to see people who had come to learn with us had been here 100% until the end of the last day, and always pressing them self out off their comfort zone to learn more. Good work students a big clap for your effort, for being so capable to learn and to have make us anchieve ou goal give the knowldge and bases so digital ignition hapen. Today was the first day of a tree days workshop where i will be teatching some web technologies, Trends and good Pratices. I must admite we had very lucky all the student’s are 5 star people and very driven to take from this 3 days workshop the mutch they can.